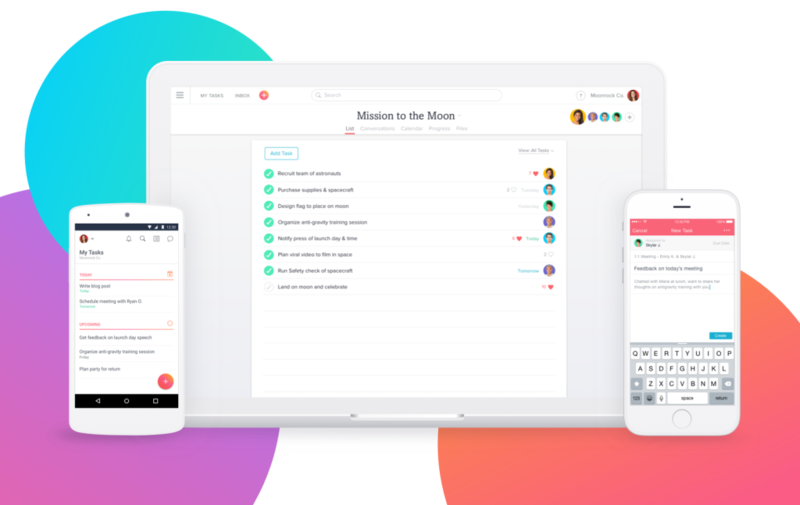 Established in 2008 and launched in Beta in 2011, Asana is a web and mobile application that allows teams to track their work, including managing tasks, projects, and conversations. Asana, which is Sanskrit for “yoga pose”, has a solid pedigree as one of its co-founders was co-founder of Facebook and the other can claim credit to inventing Facebook’s “Like” button. 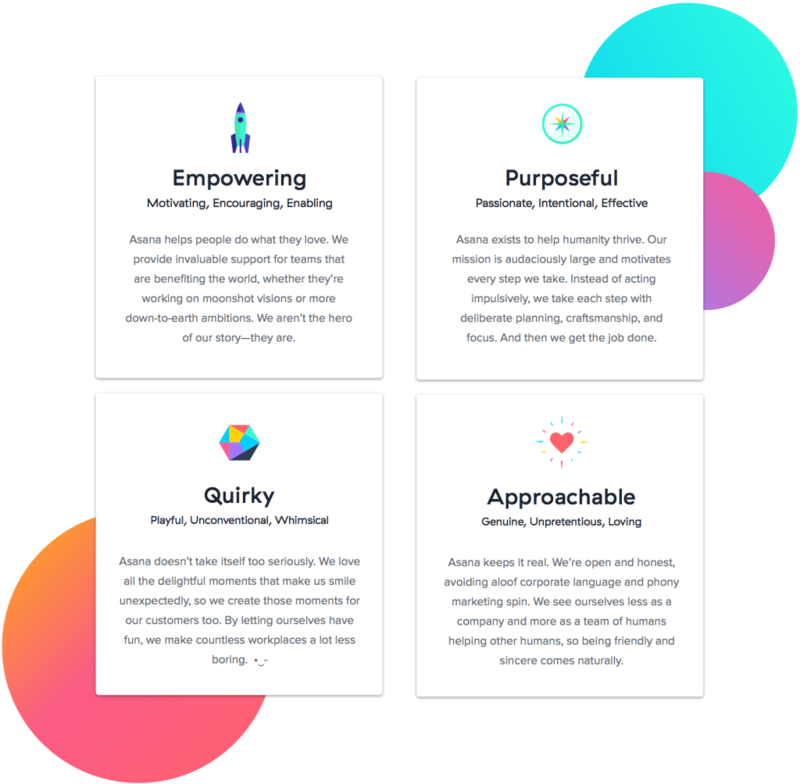 Recently, Asana introduced a new version of its software and, along with it, a new identity designed in-house in collaboration with Moving Brands. For a very extended and detailed read on the redesign process, see this post on Medium from the Asana team. In setting out to create a new logo, we knew we wanted to capture the spirit of collaboration in a simple, iconic form—a symbol that would represent teamwork for many years to come. […] Three dots used to patiently wait in line at the deli counter, but now they’re working together on a common goal. Instead of a cool green, they’re now an empowering, warm coral, with a glow that conveys the active energy between the team. The letter forms, placement, and arrangement of our logo were crafted with purpose. If you look closely, you’ll notice that there are three dots equally spaced inside the “A” letters in our word mark. The three dots are now the centerpiece of the logo and, although they are rather unassuming in their static form, when you see the video at the end of the post you might be swooning over them. The subtle gradient creates a very clever glow that makes the dots look as if they are emanating good vibes. The typography is also a great improvement with the three single-story “a”s now containing three dots of their own. I normally criticize (negatively) custom wordmarks where stems are notched in some way but here is an example that I find works properly and nicely, breaking the otherwise geometric nature of the letterforms. Sample UI animation boosts when you complete tasks. The same lightness and airiness of the logo has been applied to the user interface — or, most likely, the other way around. Everything feels in sync and considered as how it all works together as a whole. The animation above is quite beautiful and sets the tone for what the experience of using the application will be like. After Google’s dots and now these, if you want to hang with the cool kids you now know what you have to do(t). Established in 2008 and launched in Beta in 2011, Asana is a web and mobile application that allows teams to track their work, including managing tasks, projects, and conversations. Asana, which is Sanskrit for \"yoga pose\", has a solid pedigree as one of its co-founders was co-founder of Facebook and the other can claim credit to inventing Facebook's \"Like\" button. Recently, Asana introduced a new version of its software and, along with it, a new identity designed in-house in collaboration with Moving Brands.